A classic Turkish salad, found everywhere in Turkey, especially popular in the summertime. Simplicity itself but oh, so refreshing on a hot day! I’ve eaten this so many times in Turkey – at restaurants, cafes, friend’s house, aunts’ houses – and more often than not, it is served in its basic form, cucumbers, onions and tomatoes. However, I’ve also been served it with crumbled feta, lettuce and/or toasted pitta, the latter resembling Fattoush, of course. Here is how I make it more often than not. 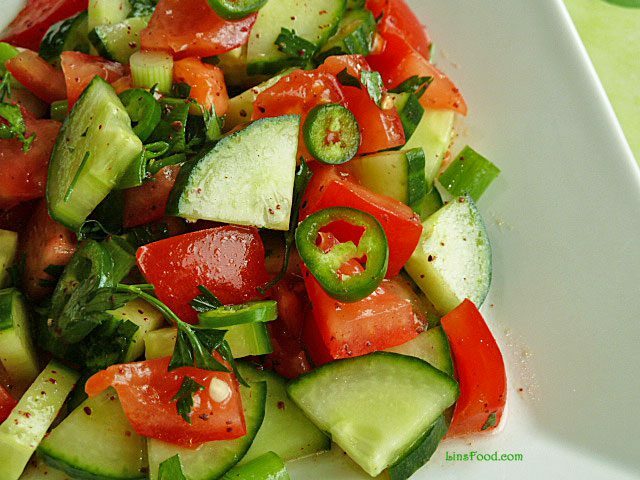 Chopping the cucumbers and tomatoes to roughly the same size makes for a prettier salad. Mix all the vegetables up in a large/salad bowl. Mix the dressing up in a small bowl, pour all over and mix thoroughly. I made this salad last night (with dolma biber and kofte) and two of my guests asked for the recipe. I lived for a year in Turkey many years ago and I am still craving the food and the culture. Tonight I am making the salad again, serving it with midye tavasi! Hey, Ian, thanks taking the time to leave a comment. It’s such a quick yet satisfying recipe, isn’t it? And I am loving all those recipes you served it with. Have you tried Hünkar Beğendi (The Sultan’s Delight)? That aubergine/cheese sauce alone is enough to enslave me! I’m very glad to see our “Çoban Salatası” recipe here! And I give your recipe 10 point, 5 stars!